A varied group of plants Dianthus are best known as Sweet Williams, Garden Pinks and Carnations. They are grown both as perennials and annuals depending on species and climate. Generally they are easy to grow, sun loving and requiring little water once established. They can be grown in pots or baskets on a patio or near a barbecue area they add colour and fragrance. In the ground they are a tough reliable plant. A great choice for the rock garden or a clump in the garden border. Despite what you may read, Dianthus do not belong the the carnation family, its the other way around, carnations are Dianthus caryophyllus cultivars. So what we call Dianthus, Carnations, Pinks, Sweet Williams are not all the same, they are however closely related. All are best in a sunny position in a humus rich well drained soil. They do thrive in good soil, however many are tolerant of poorer soils as well. These are a pest free plant and require little maintenance. Deadhead after flowering to promote a second flush of flowers. A little water during long dry spells is appreciated. With a high frost tolerance Dianthus make great border plants. Once established these plants do not have a high water requirement but do appreciate an occasional deep soaking. You can cut back dianthus after flowering using secateurs or even hedging shears. Simply deadheading by removing each spent flowerhead back to a leaf node is one way. You can also use the hedging shears to prune the whole clump back by 1/3 at once, this is quick and will revitalise the whole clump..
With regular pruning they will repeat flower all through summer. This is also a great time to fertilise. The easiest methods of propagation are by division of established clumps and by cuttings taken in summer. Take a cutting around 4 – 6 inches (10 – 15 cms) long with 4 sets of leaves. Remove the leaves from the lower half. Dip in a hormone rotting powder or some homey. Plant in a light compost. Watch for new sign of growth. Harden of in more sun. 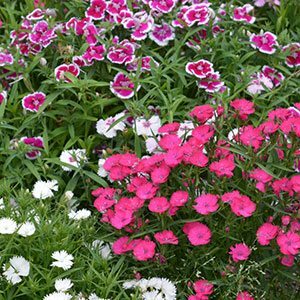 For variety, try growing Dianthus from seed. You can collect your own or buy seeds online. The seeds are small and need to be planted on a fine sifted bed of compost or potting soil.The growing medium should not be wet and soggy. Dianthus seeds are best sown in spring although early autumn can work in warmer climates. We tend to sow our Dianthus seeds in pots rather than tray, this allows us to grow them on in the pot for 12 months before dividing. They reach a good size and are easier to handle. Mist spray the surface of the growing medium. Spread the seeds as evenly as possible on the surface, mist spray again. Cover the seeds with a thin layer of vermiculate or sifted potting soil/compost. Seeds should germinate in around 14 – 21 days. Keep the seeds in a well lit position with occasional mist spraying. Once the seeds germinate keep the seedlings moist, but not wet. If you are growing the seedlings in trays, once the seedlings get to around 1 – 2 inches in height (2.5 – 5 cm) You can pot them up into individual containers. Used in the garden border, cottage gardens, picking gardens and grown in containers. Some are best in rock gardens, most are adaptable in growing conditions. Dianthus or “Garden Pinks” are a perennial plant used widely in gardens for many years. 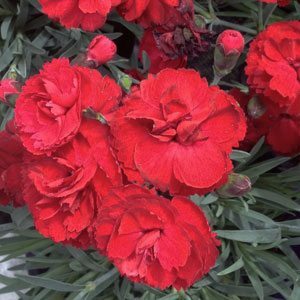 Some varieties are called carnations, however with over 300 species, the variety available is huge. Despite many of the the common names not all species and cultivars are pink. Many species are available however it is usually the named cultivars that are sold in nurseries. D. caryophyllus (Clove Pink) is a species from the Mediterranean, fragrance, drought and heat tolerant and some cultivars are often called carnations. D. gratianopolitanus or ‘Cheddar Pinks’ are similar. Dianthus deltoides (maiden pink) D. deltoides ‘Arctic Fire’ is a white flowered variety with a dark ruby eye. Foliage – Green and varied depending on species.